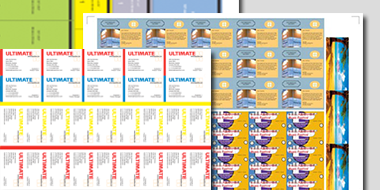 Impostrip®’s automation offers full control over page position, bleeds, page spread, page scaling, relative marks and margins to produce brochures, books and cards in many finishing fashions including lay-flat. Impostrip® can impose JPEG, PDF, Optimized PDF and PDF-VT files. Impostrip® provides full flexibility and increases the quality of each print making print production more profitable. Think differently about imposition. Automation drives results. Designed with productivity in mind, Impostrip® OnDemand Automation optimizes every aspect of your prepress imposition workflow with tools that are easy-to-use yet extremely versatile. Provides a new level of prepress performance. Increases the quality of each print making your business more profitable. 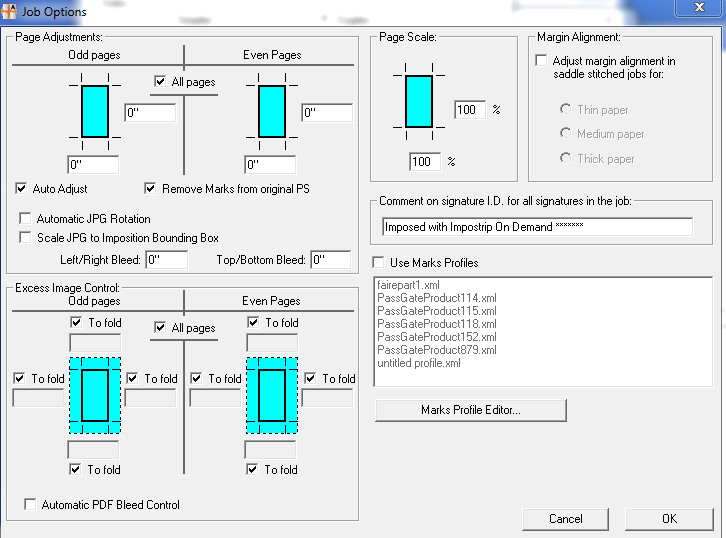 Automatic control over page positioning and markings maximizing efficiency. 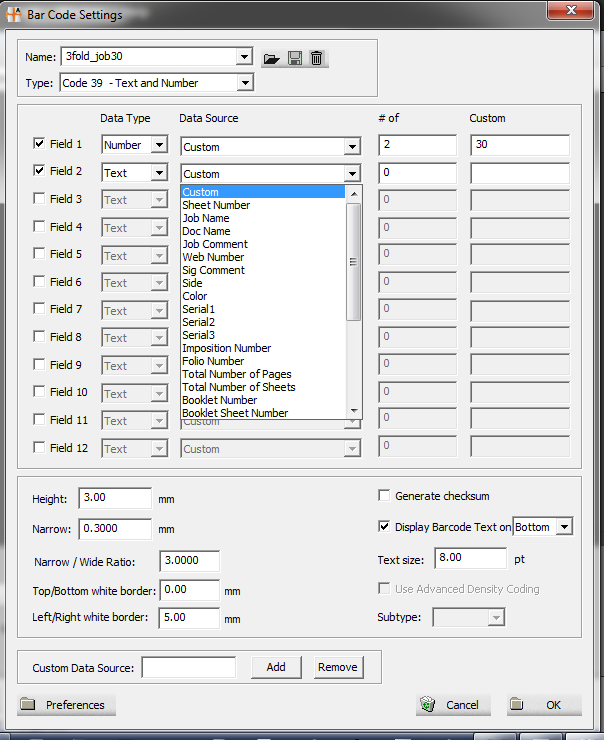 Optimized PDF output capability for extra speed on personalized projects. Makes short run jobs more profitable through advanced JDF/XML automation. Connect Impostrip® to your MIS or store-front for workflow automation. Increase margin on jobs by grouping more books together automatically. Origami virtual paper folding for easy template making. Dynamic Hot Folder provides the ability to use the same hot folder for multiple jobs. Output Optimize PDF for VDP personalization. Dynamic barcode composition for tracking, quality control and finishing automation. XML Director Module to connect and streamline orders from store-front and MIS. 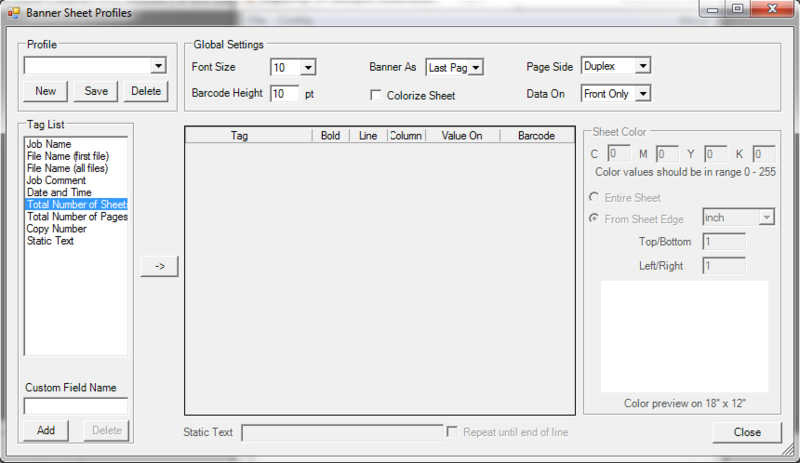 Configurable banner sheet with variable content (job name, barcode…). Supports for web sectioning reducing blank padding. Grouping various jobs for web width optimization. Provides on-the-fly collating marks placement. Purchasing Impostrip® is not only easy and quick, but the setup is as well. Most customers do not take more than a day to get up to speed with all the features and hot folder creation. Once up and running, Impostrip® becomes hands-free and works for you every day. Impostrip® is not only designed to automate, it is designed to make your life easier, and this also includes the at setup time. Available for Enfocus Switch 12 on Mac and Windows and is compatible with: Impostrip Automation for Windows v.8 and onwards, Impostrip Scalable for Windows v.8 and onwards and Impostrip Solo for Mac v.9.4 and onwards. Producing on demand books is made easy using Switch and Impostrip OnDemand Automation in a digital or hybrid environment. This Flow allows you to receive job requests, to filter through the number of copies to be printed in order to either send the job offset or digital. In this case we are using 1000 copies as the cut-off point. If the book will be printed on an offset press, the Flow then separates will proceeds with an 8-up imposition scheme if the book size is less than 6x9, and as a 16-up if the book size is larger than 6x9. If the book goes to a digital press, the Flow then proceeds with a 2-up imposition scheme using repeating booklets. In both cases, respective offset or digital marks will be automatically placed. There is also no need to filter through document by size or length, since Impostrip OnDemand Automation will read the incoming file size and dynamically adapt the imposition scheme accordingly using the Adobe© Library embedded in the software. This Flow can easily be adapted to fit any production site’s needs by modifying certain parameters. Receiving orders through the Web is made easy using Switch and Impostrip OnDemand Automation, allowing print service providers to gang different jobs of different sizes and quantities, automatically and seamlessly for sheet optimization. This flow connects to a Web storefront or MIS database. Switch will wait and assemble different orders in a folder, separating simplex and duplex work. Although the AutoFlow ganging feature of Impostrip On Demand Automation allows grouping any size together, in some cases, it might be optimal to regroup similar sizes together in order to completely eliminate waste. This flow will therefore gather different jobs of different sizes together while grouping similar sizes together thanks to Switch. In order to reach maximum optimization, Impostrip On Demand Automation will read the quantity needed for each job, and AutoFlow will group these jobs together in an optimized way to save paper and place a barcode on each item identifying which job it belongs to. 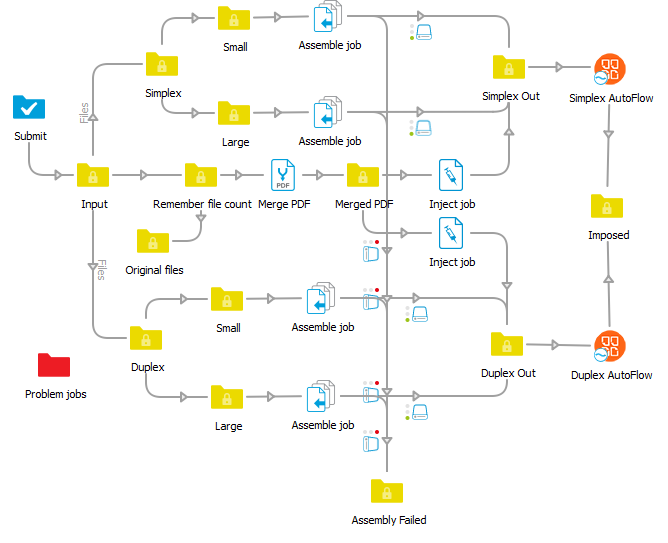 AutoFlow job optimization gangs for maximum use of a sheet, while respecting finishing logic for cutting. This Flow can easily be adapted to fit any production site’s needs by modifying certain parameters. 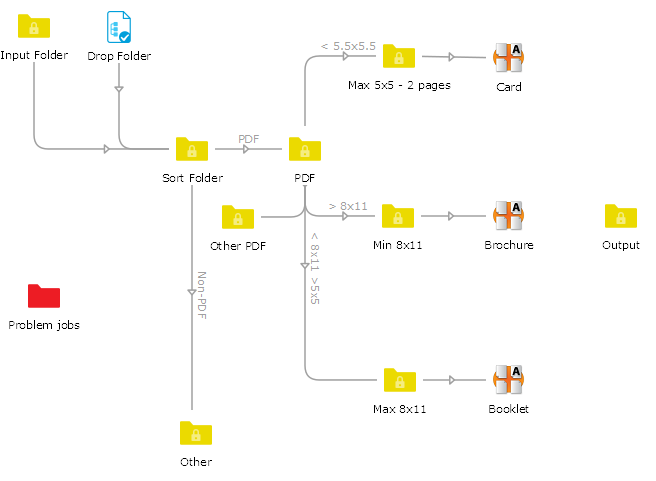 This flow gives the ability to impose a single PDF file or a folder containing multiple PDF files. The Input folder detects if the incoming job is a file or a folder, as well as reject all non PDF files. 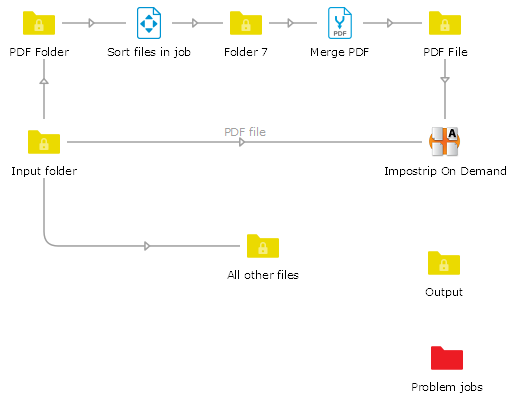 When using a folder, the PDF files placed in this folder are sorted and merged into a single PDF file which will then be imposed as single file. 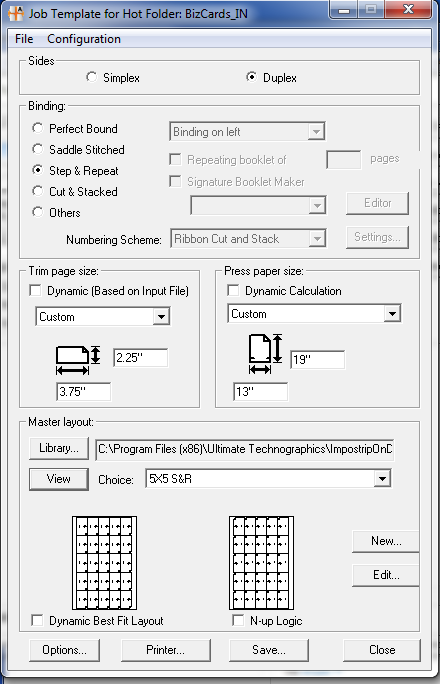 This flow imposes input files depending on the page size of the incoming document using Impostrip OnDemand Automation's unique Dynamic Imposition feature. This Flow contains an Input Folder (or Drop Folder) which can be used to submit the jobs. The Sort Folder will ensure to reject non PDF files. The files are then sorted according to the size of the job, wether it's a card, a booklet or a brochure. (Card < 5.5x5.5 ; 5.5x5.5< Booklet < 8x11 ; 8x11< Brochure).